It still feels peculiar as a vegan to exclaim “I like cheese!”, but I do! When I learn of a new vegan cheese, or new to me, I jump at the chance to give it a try. On Instagram, I started to see buzzing that So Delicious created a line of vegan shreds. Being a fan of their ice cream treats, I knew I wanted to give these shreds a try. After a couple of months of waiting for them to appear in my local stores, I finally found them at an area Whole Foods and grabbed one of the last two on the shelf. I am now able to get all three flavors regularly in my area. The shreds are gluten free, vegan, soy free and non-gmo verified. The shreds melt well. They melted instantly in my microwave testing and quickly in the oven. I have tried them in mac n cheese, nachos, and a sandwich. This cheese tastes good out straight of the package. Hold the presses! Yes, you read that right. I have tried the Mozzarella and Cheddar and they taste reminiscent of their dairy counterparts, as is. Watch yourself as you might eat the whole bag before it heads to food! They are perfect for pizza! 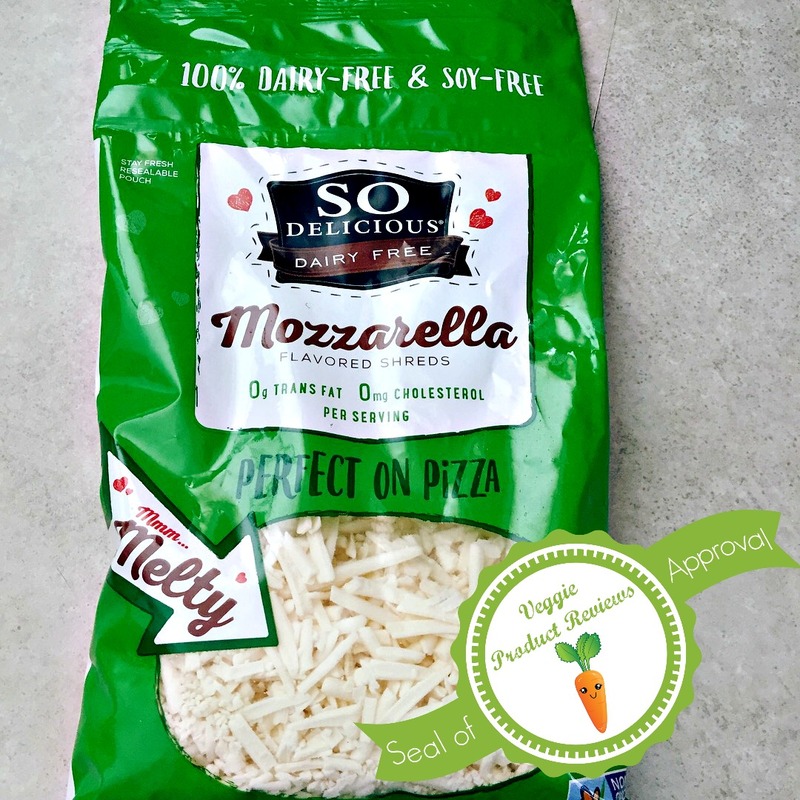 I haven’t yet tried them on pizza, but seeing how they worked on other foods convinced me that I have to buy another bag and make pizza. This product would be a great one to share with your dairy eating friends to show them how delicious veganism alternatives can be! They have three flavors: Mozzarella, Cheddar, and Cheddar Jack. 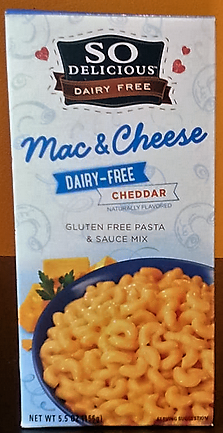 I hope to try Cheddar Jack soon! If you are a reader of the blog, you can probably already anticipate the first con. Price. Like all other vegan brand name cheese options, the bag was pricey. I am pretty sure it was priced the same as Daiya at over $5 a bag! Vegans aren’t made of money! An area where I feel that vegan cheese makers are failing is in the nutritional content. Many people who eat dairy cheese do so because it has calcium and protein. Yet very few, if any, of the vegan brands have protein and calcium. This brand has zero for both. While I don’t need to get these from vegan cheeses in my diet, I know this could be a impediment to others switching to vegan cheese. It is fattening! It is made from coconut and has 7g of fat per serving. I looked up a brand of dairy mozzarella and it was only 3g of fat per serving. It is not available as widely as other vegan brands. I hope it will be soon! If you have been following our blog, you probably think we like just about everything since we have provided all positive reviews so far. To keep it real, I am posting a review today about two products that are sub-par in my opinion. Let me preface this blog by saying that I am not a picky person. I like just about everything. Even the things that I don’t love, I eat. I am not the biggest fan of watermelon, sweet potatoes, pudding textures, or yogurts- but I eat them all (vegan of course!). We actually eat sweet potatoes quite a bit in the fall and I have started to like them in savory form. Maybe I should take them off my “not the biggest fan of” list then! Even with this list, I can usually choke something down if I don’t like it. I can even do this with a smile! I also married someone who likes just about everything. His only real dislike is asparagus, but we eat it often because he is like me in that regard. Even as I post this review, I have to note that I ate all of each of the products in this review (not in one sitting, of course) because I hate wasting food. I always hear in my head “there are starving kids in X who would appreciate your food” spoken in a mothers voice. I clean my plate always and save leftovers for later. We don’t like to throw food away. It seems like a sin to me! To save you from having the need to throw away food, I must tell you about two products that are better left on the shelf. 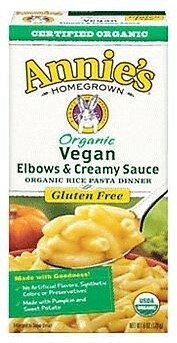 Enter Annie’s vegan and gluten free elbows and creamy sauce and So Delicious cheddar mac n cheese. I was extremely excited to try both products and had high hopes. Those expectations were quickly brought down when I hate the first few bites of each. I really wanted to like them. I wanted more choices when I went to the grocery store. I wanted to be able to recommend these products, but I can’t. Let’s start with Annie’s. The recipe has pumpkin in it so I thought it would be a creamy pumpkin goodness. Boy! I was wrong! It tasted like a cross between chemicals and wasabi. I must note that John tasted wasabi, I don’t know what I tasted after the chemicals. I even tried my hot sauce test where pour a bunch of hot sauce on something to make it edible. Fail! I tasted the chemicals above the hot sauce. Then a few weeks later after I had recovered from the Annie’s mess, I tried So Delicious cheddar. It was so weird! It didn’t tasted like cheddar at all. It actually had a metallic taste to it and it left a horrible taste on the sides of my tongue. I also tried the hot sauce test and it failed. The metallic taste came through hot sauce. I put the remainder in the fridge and decided to try it the next day to see if the flavor would improve. You have probably already guessed that it didn’t. I must note that I also tried the So Delicious pizza mac n cheese and it wasn’t as bad. I plan to buy it again and do a separate review once I recover from this fiasco. 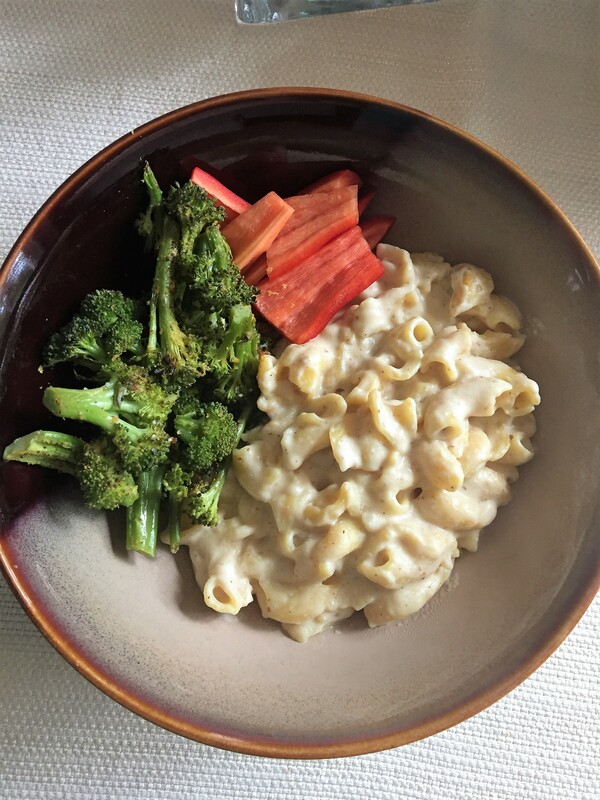 I also plan to review the delicious vegan mac n cheeses on the market. Until then, please go forth and eat good mac n cheese! Please check out Jennifer’s blog- My Blissful Journey. We are loosely participating in an off season link up where we pick three topics to blog about. I picked a topic not on her list- “New vegan products that I have tried and NOT enjoyed”.